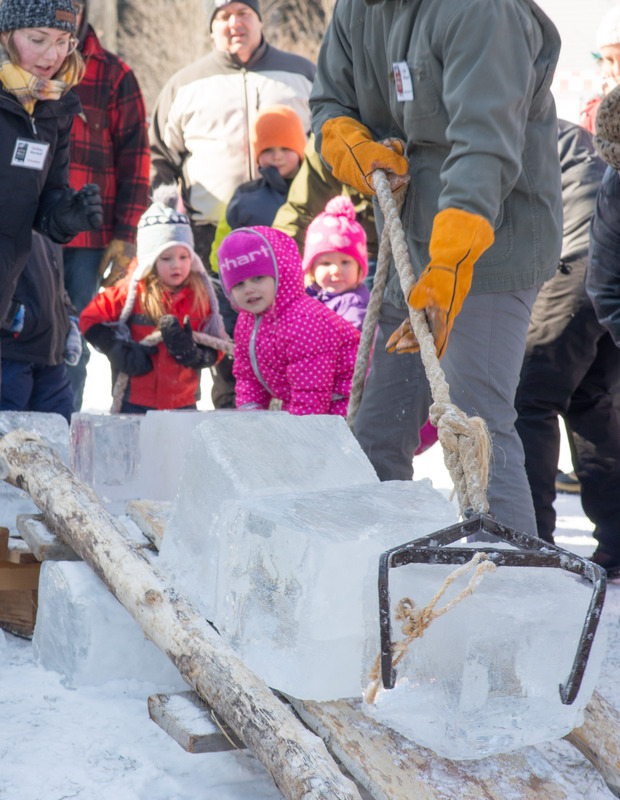 Come enjoy a day of hands-on history and winter fun. Ice harvests were once an essential part of winter in rural communities. Before there was refrigeration, ice was needed to preserve agricultural products and to keep food cold in the warmer months. 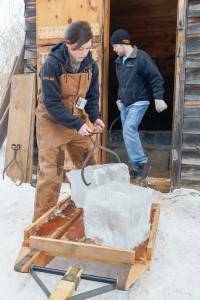 Hanford Mills Museum celebrates this rural tradition with the Ice Harvest Festival. 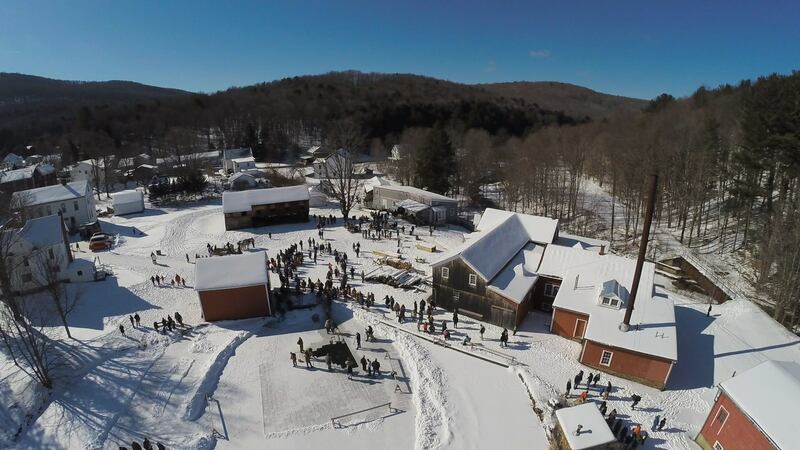 browse and shop from local farmers and vendors including Byebrook Farm (Farmstead Gouda cheese), Catharina’s Hats and Mittens (handknit Swedish-style mittens and hats), Cabana Coffee (lattes, hot chocolate and coffee), and the Cooperstown Distillery (handcrafted spirits). make a sketch with the Catskill Interpretive Center’s new Catskill Art Club (supplies provided or bring your own). tour the Museum’s advanced pellet boiler and district heating system and learn about clean heating and cooling technologies from Heat Smart Otsego. stop by the John Hanford Farmhouse to see how folks lived in the 1920s, and see how they baked bread and cookies using the Royal Bride wood-fired stove. 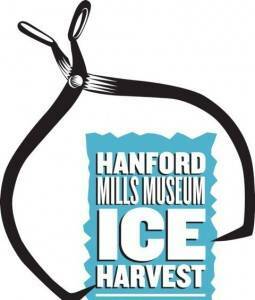 The Museum monitors and grooms the ice in the weeks leading up to the Ice Harvest Festival. Find out more about ice conditions, and tips for your Ice Harvest visit. The Hot Soup Buffet is a delicious way for visitors to warm up during Ice Harvest. Restaurants that donated soup and chili in 2019 were: Alex’s Bistro, Alfresco’s Italian Bistro, Applebee’s, Autumn Cafe, Blue Bee Cafe, Brooks House of BBQ, Cafe Ommegang, College Association of Delhi Inc. (CADI), Cooperstown Diner, Cross Roads Cafe, Danny’s Market, Delhi Diner, Denny’s, Fiesta Mexican Grill & Cantina, Green Earth Cafe, Jackie’s Restaurant, Jay’s Place, Mel’s at 22, Morey’s Family Restaurant, Oneonta Bagel Company, the Otesaga, Signatures Restaurant, Simply Thai, Sloan’s New York Grill, and SUNY Delhi Hospitality Program. Proceeds from the soup buffet and cookie sale (baked goods provided by Junkyard Bakehaus) benefit the Museum’s educational programs. The Ice Harvest Festival is sponsored by the SUNY Delhi Hospitality Management Department, The Daily Star, WSKG. and Five Star Subaru. Hanford Mills Museum is very grateful for their generous support. TripAdvisor review of 2018 Ice Harvest: Ice Harvest Festival…So Worth It! !